Police Commissioner says that the quick thinking of the murdered security personnel stopped the terrorist from infiltrating town. 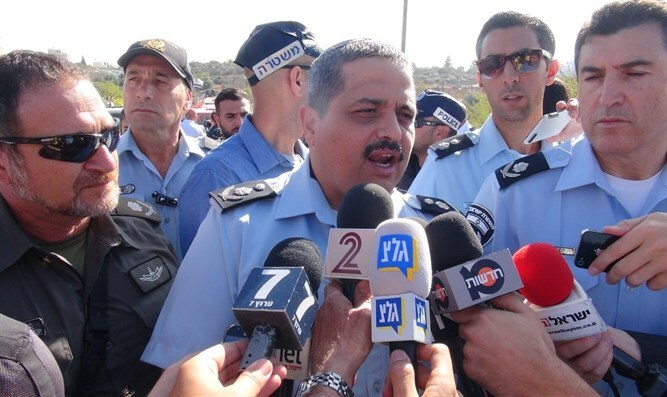 Police Commissioner Roni Alsheich reacted to the terror attack in Har Adar that killed a Border Policeman and two security guards Tuesday morning, telling reporters that the murdered security personnel's quick response to the terrorist stopped him from infiltrating Har Adar. Alshiech noted that the terrorist had worked in Har Adar before, and was well known to security officials that were tasked with screening Palestinian Arab workers. "The terrorist aroused the suspicion of the security coordinator, and when they asked to check him he pulled out a gun and started shooting, hitting the security coordinator, two security guards, and a Border Policeman," Alsheich said. According to Alsheich, the wide range of backgrounds the terrorists come from makes it hard to prevent attacks. "To my regret, there is no profile for a terrorist,” he said. "We see adults, married women, young people. It could just be someone who is fed up with everything and decides to take out his rage in an attack"
The police have gotten hit hard recently by terrorism. In July, two police officers were murdered in a shooting attack on the Temple Mount, and Border Police officer Hadas Malka was killed in Jerusalem's Old City in June.